20 cm 168 p. : ill. 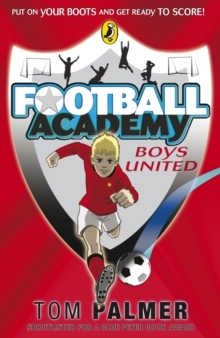 Boys United: the first book in the Football Academy series by Tom PalmerJake loves football and dreams of becoming a professional footballer. He's worried about his height though - what if he's too small for football? But on the day of his trial Jake is quick on the ball and scores - he's made it! Jake can't wait to pull on his shirt and join the team. But someone at the club wants to make his life difficult. Can Jake face up to the bullies and become man of the match again?Stay on the ball this season with the first four stories following the boys in United's under-twelves. As well as being a huge football fan, Tom Palmer has an international reputation in reader development. He is a coordinator of the Reading Partners consortium, works with The Reading Agency, Booktrust and the National Literacy Trust, and has been the official writer for the Premier League Reading Stars scheme for five years. He is the author of the Football Detective series, also for Puffin Books.